A comprehensive approach to controlling heat in the data center and other mission-critical facilities. 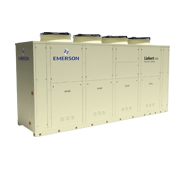 Liebert products, solutions and services from Emerson Network Power optimize data center infrastructure through cooling and monitoring technologies. Optimize Data Center Cooling Units for Higher Protection. Manage and control data center cooling units to improve protection, automate cooling system routines and simplify maintenance. Standard equipment on certain Emerson Network Power cooling units. Available as an upgrade to existing cooling units. Advanced algorithms optimize cooling unit operation for load and environmental conditions. User authorizations for security and on-board change log. Factory-installed and configured on Liebert cooling units. Large format touch-screen can be user-defined. Predefined and configurable failover routines and staging and valve routines. Optimize the Entire ​Cooling System for Higher Efficiency. Manage and control your entire data center cooling system for up to 50% higher efficiency, improved protection and greater productivity. Liebert iCOM-S provides a single point for managing your entire cooling infrastructure and gaining quick access to actionable data, system diagnostics and trending. Available as an upgrade to existing Liebert equipment. Single point for accessing data from all sensors and cooling units. Teamwork modes to harmonize the operation of multiple cooling units. Pre-configured for operation with Liebert iCOM unit controls. Pre-configured for sensor bonding and can detect and configure up to 4,800 wireless sensors, reducing sensor installation costs by up to 50 percent. Multiple zone support for configuration of different types of cooling spaces within the data center. 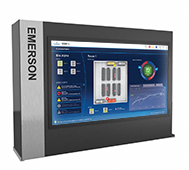 Large format touch-screen simplifies configuration and access to functions and reports. Liebert Air Economizer, GLYCOOL Economization Option, and Chiller Plant Compatibility. 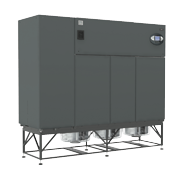 Fluid and air-side economizers take advantage of cold outside temperatures to provide “free-cooling” cycles that reduce or eliminate the operation of data center cooling system compressors and pumps. 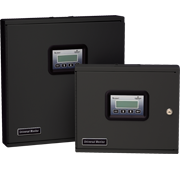 Using economizers, you can lower heat management energy usage by up to 50%, depending on the average ambient temperature and humidity of your site. Free-cooling options reduce compressor and pump operation. Monitors and controls operation with Liebert iCOM. Greater protection and lower operational risk. Capacity on demand for dynamic load management. Rapid ROI through faster project implementation. Free-Cooling Direct and Indirect Evaporative Systems. Liebert free cooling evaporative cooling systems transform data center design and meet the efficiency and availability needs of the largest, most complex data center environments. Comprehensive configuration and project management services ensure that our solutions fit each customer’s specific requirements. High-strength thermal-break construction with 2” foam-injected walls, doors and flooring providing an R-value of R12 for greater efficiency and durability. Standard Casing Ratings: DLC of 5.0 & Panel deflection of L/250. Frame and removable panel design allowing for service or replacement of large internal components. Welded or bolted-base construction for high durability and strength. Standing-seam roof construction eliminating water infiltration. Optional 4” enhanced casing offering greater energy efficiency with an R-value of R24 and additional acoustical and corrosive environment protection alternatives (Leakage rate of less than 1% at 10” & Panel deflection of L/400 at 10”). With Proper Maintenance, Unit Construction Engineered to Last Over 30+ Years. Free-cooling Economization Without Using Water. 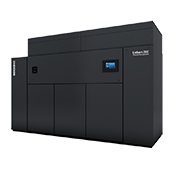 The Liebert DSE is the industry’s first pumped refrigeant economization system designed specifically for data centers. Ideal for companies seeking sustainable solutions, it provides up to 50% higher efficiency than traditional systems – and it uses no water. Its advanced controls automate economization to get the most free-cooling in any environment. Highest efficiency data center precision cooling system. PUE as low as 1.05. High capacity models from 80-150kW. First ever pumped refrigerant economizer – includes auto mode switching. 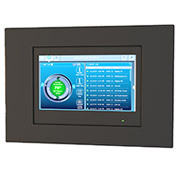 Next generation Liebert iCOM controls. High Efficiency, Rapidly Deployable Chilled Water System. Rapidly deploy chilled water capacity, achieve higher efficiency and use less white space. The Liebert CW system offers the industry’s widest range of capacities, featuring the industry’s most advanced controls and innovations, such as optimized coil design that maximizes capacity and efficiency even at high entering water temperatures. Precision cooling and humidity control. Offers upflow and downflow models. Provides energy efficient fan options. Significant energy savings on downflow models with optional air economizer. All models compatible with chiller plant economization. World’s Most Reliable Direct Expansion Cooling System. Improve data center efficiency and protection with the world’s most flexible and reliable direct expansion system. The Liebert DS system uses the industry’s most advanced thermal controls and features a modular design, multiple compressor options and easy service access. Provides component redundancy compressors, motors and blowers. Offers multiple configurations and sizes for flexible application. Allows installation in upflow or downflow configuration, and in Air, Water, Glycol, GLYCOOL economizer models. Offers ultra energy efficient GLYCOOL economizer and Dual Cool hybrid models. 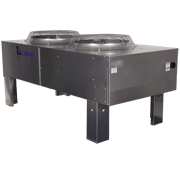 Downflow models compatible with optional air economizer. Highly Flexible In-Row Cooling System​. 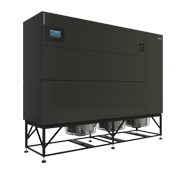 The Liebert CRV system offers highly flexible, in-row cooling for data centers requiring higher density cooling with greater efficiency and capacity. The system is designed for small and medium data centers or higher density containment applications in large data centers. Installs within the row of racks. Features variable speed EC plug fans and variable capacity digital scroll compressor. Operates efficiently with Liebert iCOM controls. Small Footprint, High-Capacity Cooling. 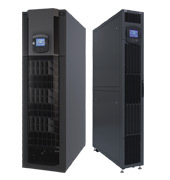 The Liebert PDX and Liebert PCW systems offer the industry’s highest efficiency, protection and capacity per footprint for server room cooling. network closets and other small spaces. Available in chilled water and direct expansion configurations. Energy-efficient and flexible high heat density Liebert XD and Liebert DCW cooling solutions optimize data center infrastructure design. Liebert high density data center cooling solutions are available with open or closed architecture, and pumped refrigerant-based or water-based technology. 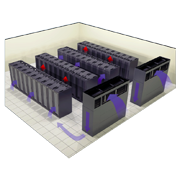 High heat density system delivers data center cooling for more than 30kW per rack. Liebert XD offers floor-mount, rack-mount and ceiling-mount configurations. Utilizes pumped refrigerant, which is ideal for use around electronic equipment. Enhances the hot aisle/cold aisle approach to thermal management. Water-based high heat density data center thermal management solution. 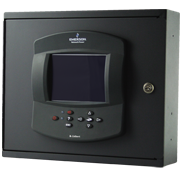 Offers rack enclosure and door-mounted models. Leverages existing building chilled water loop. 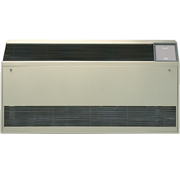 Liebert XDA provides an easily-installed rack fan unit to enhance existing data center heat management solutions. Highly Efficient Outdoor Heat Rejection With Less Refrigerant Use. The Liebert MC Microchannel Condenser is an outdoor air-cooled condenser that provides higher efficiency, while using less refrigerant. Features such as variable speed fans, advanced controls and a microchannel coil make this system uniquely innovative. Improves unit and system efficiency at full and partial loads. Increases condenser full load energy efficiency by 30-50%. Reduces refrigerant volumes and deceases refrigerant charge levels in matched condensers – by more than 50% on non-Lee-temp systems and more than 20% on Lee-temp systems. Is compatible with Copeland® Digital Scroll™ Technology compressors. Chiller providing cooling capacities from 192kW (55 tons), 285kW (81 tons) and 362kW (103 tons). The Liebert HPC-S Chiller with R410A refrigerant is available in capacities from 192kW (55 tons), 285kW (81 tons) and 362kW (103 tons). The total combined effect of the Liebert HPC-S unit’s leading technologies delivers up to 40% annual energy savings over standard systems. Zero-Footprint Cooling for Small Spaces. 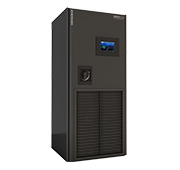 The Liebert Minimate2 is a zero-footprint computer room cooling system for 7×24 temperature and humidity control and air filtration. 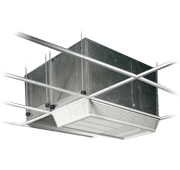 It installs above a dropped ceiling and is easy to service, requiring only front access for maintenance. Ceiling-mounted cooling and humidity control. Installs as self-contained or split system. Offers direct supply/return or ducted applications. Cools small rooms or hot spots/zones. Small Footprint Precision Cooling System. Small footprint cooling system for 7×24 temperature and humidity control in network closets, computer rooms and other small spaces. Its low profile permits floormount or wallmount installation, and requires little or no floor space. Wallmount cooling and humidity control. Cools hot spots or zones. Installs as self-contained or split systems. Air-Cooled Outdoor Condensers for Liebert Cooling Systems. These easy-to-Install and service air-cooled condensers for outdoor heat rejection are precisely matched to the requirements of Liebert data center cooling and fluid chiller systems. Operates in low temperatures with winter operation models. Large-Scale Centralized Monitoring and Control. Liebert SiteScan allows monitoring and control of virtually any piece of critical support equipment — whether located in the next room or in a facility on the other side of the country. 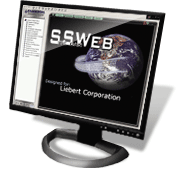 The web-based system provides centralized oversight of Liebert precision air, power and UPS units, as well as many other analog or digital devices. Features include real-time monitoring and control, data analysis and trend reporting, and event management. Provides real-time monitoring and control. Operates compatibly with existing Building Management Systems. Monitoring of All Data Center Networked Equipment. 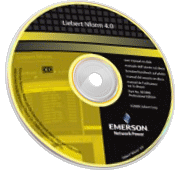 Liebert Nform centralized infrastructure monitoring software solution provides data center monitoring of equipment for companies of every size. It provides network management of distributed Liebert equipment with notifications and messaging, with software versions available to meet business needs. Centralized monitoring and control of SNMP devices through existing NMS. Provides email alerts and local notifications. Offers a scalable software solution for businesses of any size. Team Communication and Lead/Lag Operation for Liebert Equipment with iCOM Controls. Network switch that interconnects cooling units equipped with iCOM controls, allowing the units to communicate and function as a team, and allowing lead/lag operation. Network switching for Liebert iCOM controllers. Facilitates team function for Liebert iCOM. Remote and Local Monitoring and Control of Liebert Equipment. The Liebert Universal Monitor provides high-availability data center monitoring and visibility through multi-sensing, cooling and power monitoring, remote communications and control. It can operate as an independent, stand-alone controller or in conjunction with Liebert SiteScan Web centralized monitoring system. Packaged alarm and notification unit. Monitors and controls Liebert equipment locally and remotely.